Cardiff Half Marathon 2015 Biggest the City has ever seen! Cardiff Half Marathon 2015, 2nd largest Half Marathon in the UK! – The 2015 Cardiff Half Marathon saw a whopping 16,000 people crossing the finish line after the gruelling 13.1 mile run. 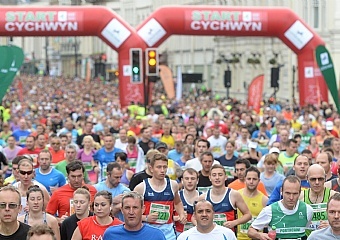 This year”s event has been recorded as Wales” largest ever mass participation event and the second largest Half Marathon within the whole of the UK, over 50,000 people lined the streets of Cardiff offering their support to all the runners, from the elite to casual runners. The 2015 Cardiff Half Marathon was also broadcasted live on the BBC for the first time ever broadcasting this fantastic event across the nation. This event has shown a massive success and shows that Cardiff is ready to host the biggest Half Marathon event in the World in March 2016 the IAAF World Half Marathon Championships, with athletes from across the World to come and get involved. 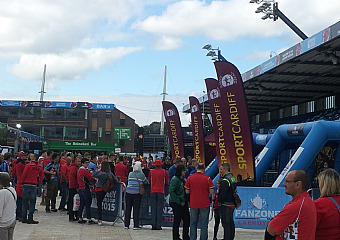 Cardiff”s Rugby World Cup 2015 Fanzone Success! – The Cardiff Fanzone for the Rugby World Cup 2015 success! The Fanzone based at Cardiff Arms Park on 18th September to the 18th November saw over 160,000 people from all over the world visiting over the course of the event, screening live RWC 2015 matches in action, viewing some incredible international Rugby. We would like to thank those 46 fantastic volunteers who helped the Fanzone to be so successful, volunteering over 1000 hours, putting on games, entertainment and providing useful information for all that attended. The Rugby World 2015 Saw the New Zealand All Blacks win the competition for the staggering 3rd time, more times than any other country in the world. We are looking for coaches to lead or support the lead coach during Cardiff Archers AC training sessions in order to increase the number of club coaches that support athletes. Established in 2012, Cardiff Archers is a vibrant junior athletics club which developed from our existing junior athletics academy. We take young athletes from 5 years of age onwards and provide the platform for them to compete in both local and national competitions in Track + Field, Cross Country and Road Running. Coaches will need to have experience of coaching children and hold a Level 1 coaching qualification in Athletics or another sport. Specific Athletics training will be provided to those with no previous experience of leading or supporting Athletics sessions. This opportunity can lead to payment opportunities for coaches in Athletics and other sports as part of our Sports Academies network. As part of the Cardiff Games, Sport Cardiff are pleased to offer pupils in year 8 and 9 to take part in a competitive basketball competition against schools from Cardiff and the Vale. You’ll be asked to help support the event by keeping score and ensuring the competition runs to time! Volunteer at one of the biggest competition of the Cardiff Games. With 27 teams from 19 schools it promise’s to be non-stop. Assist the Sport Cardiff team in the smooth delivery of this competition through a variety of roles. Help support the formatting of the day and keep the schools on track! Primary and secondary schools competing for medals and points across five sports. In partnership with Cardiff City Foundation. Sports include: Boccia, Wheelchair races, tennis, basketball and golf. Volunteers wanted to assist staff and coaches in delivering competitions at stations for each of these sports. Help set up and pack away a sports event for families with disabled children. Support coaches with delivering sports activity during the event.